I finally got around to review another nail salon a few weeks ago. 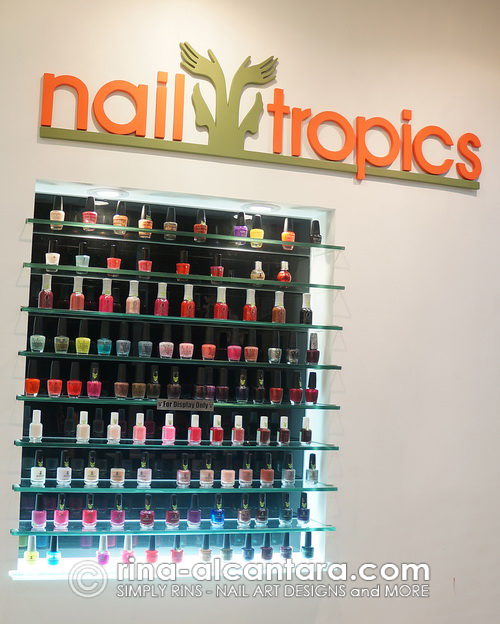 Nail Tropics recently opened a branch at Trinoma Mall in Quezon City mid of March this year. Among the salons that I was planning to visit, it was closest to home so I decided to get some pampering one lazy day. The idea of getting my nails done will probably remain to be one of the "me" times that I will always look forward to. I particularly enjoy hand and foot spa, and the short massage that comes with the service. But like most girls that shares the same interest, I fear getting cuts during a manicure or a pedicure. And this (sometimes) gives me hesitations. Nail Tropics (Trinoma) is the latest to open its doors to the public among the 6 branches in the metro. They primarily offer hand and foot care services. 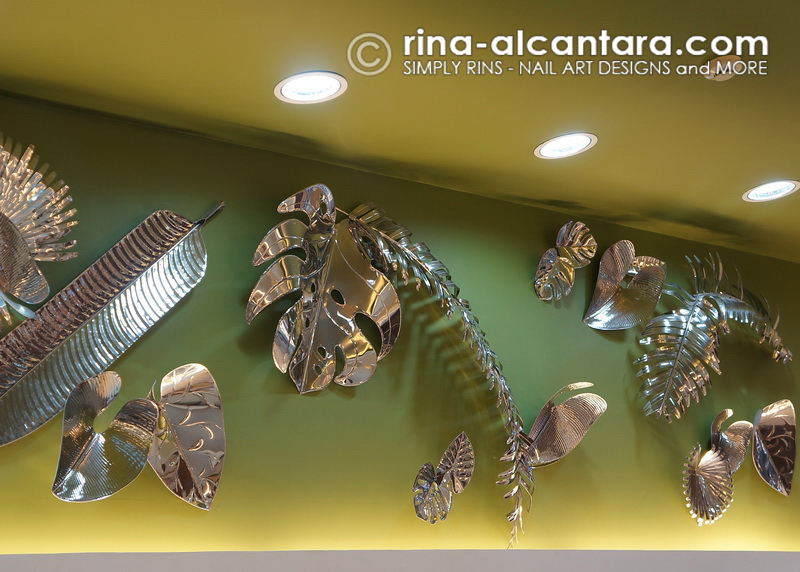 All Nail Tropics shops are nature inspired and promote eco-friendly and organic services. The branch in Trinoma can comfortably sit 10 clients. The space is rather narrow compared to other Nail Tropics branches so I suggest you come in during non-peak hours for a more relaxing experience. Nail Tropics is known for this style of beach chair. Services are available for all the ladies and gentlemen. Baby your hands and feet with The Breath of Milk, an ultraluxe hands and feet facial composed of warm milk and shea butter, followed by a nail wrap to soften severe dry cuticles and whiten stained nails, inclusive of a signature massage & polish. Foot soak with milk and shea butter. The soak also included a few slices of calamansi (lemon) to help whiten the nails. The same solution was used for the hands. Hand soak with milk, shea butter, and calamansi. It was different from the usual soak I have whenever I get my nails done but in a good way. I felt like Cleopatra bathing in milk. Well, at least my hands and feet did. It was a good experience. Results was not immediate but I expected that. Regularly availing of this blissful treatment will hopefully yield more visible results. From all the nail salons that I've visited, Nail Tropics has a good variety of hand and foot services on their menu. And when I say variety, it's NOT just a mix or upgrades of manicure, pedicure, and massage. You can actually select packages that targets a specific concerns. For example, if want to address tired hands, you can avail of the Citrus Breeze manicure spa that is particularly designed to relieve stressed hands. Rolled towels are the usual hand cushions used by nail salons here or for some, nail technicians use the arm rests of the sofas. 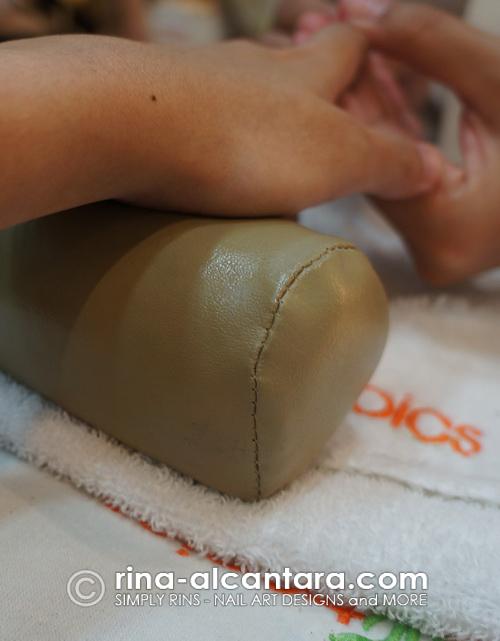 I personally like the small but effective hand pillow Nail Tropics (Trinoma) used during my visit. It has enough firmness that didn't tire my wrist and the material makes it easier to clean in between clients. Unique hand and feet cushion on a mini tray. I don't know if I termed this correctly but I love that they used a tray that sits comfortably on your lap during the hand soak and is used by the nail artisan during the manicure session. Again, simple and effective. 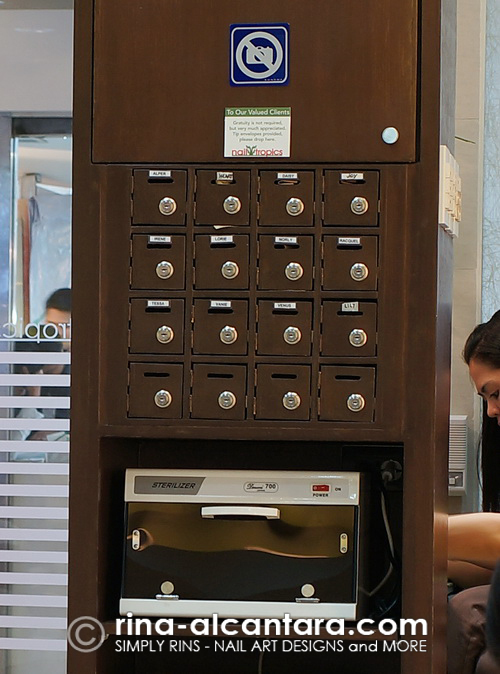 Spotted inside Nail Tropics (Trinoma) is a sterilizer. This is always a plus for me. It gives an impression that tools are cleaned and sterilized in between customers. Only an impression because I didn't see it being used during my visit, even if the one that did my manicured attended to her next client. This scenario sort of defeated the visibility of that sterilizer. I am left to assume that tools are only sanitized at the end of the day maybe. Nail technicians on some nail salons pour alcohol on their paraphernalia in front of their client. This appears to be a better practice for hygeinic purposes. I think it is a clever idea to have a tip box for each nail artisan available for clients inside the shop. This makes it easier to leave a form of gratitude to your nail technician/s without disturbing them if they are attending to another customer. Tip boxes for each nail artisan and a sterilizer. 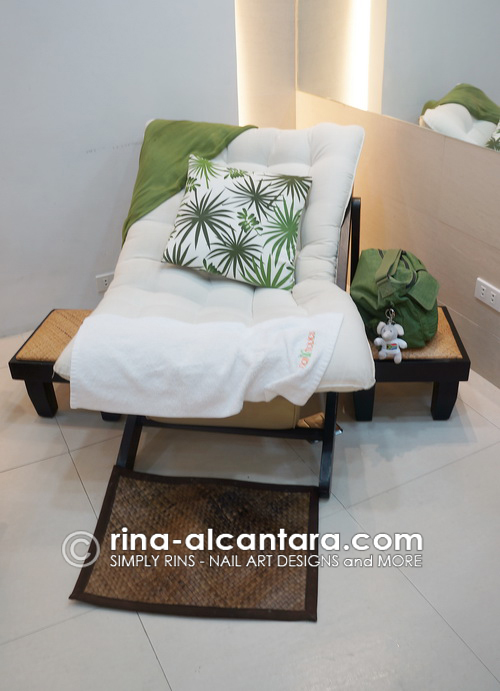 Unlike the other branches, Nail Tropics (Trinoma) lacks more space for a more relaxing feel. The salon got really busy during my visit and nail technicians had to be a little careful when moving around. It's not a relaxing sight for clients because it makes the area vulnerable to accidents. I think it is important for nail techs to know the services in and out. There will always be clients who would be curious on the various stuff being used during the service. During my stay, I kept asking what was being rubbed or used but I almost always get vague answers. Wrapping each nail with cotton pads soaked in calamansi was part of the Breath of Milk blissful treatment that I availed. A hand wrap accompanied this. The cotton pads were placed on top of each of my nails and my hands were rubbed with a substance (I don't know what for) before being wrapped with plastic. Problem is, I move a lot. The cotton pads were easily misplaced even with small movements. I would probably suggest using foil wraps on each nail to make sure each pad stays in place and this would be a more effective for the nails to absorb the whitening solution. Nail and hand wrap included in the Breath of Milk blissful treatment. Nail Tropics in Trinoma Mall, Quezon City is particularly located at the 2nd floor, near the Mindanao Avenue parking area. Business hours is from 10am-9pm during Monday to Thursday, and from 10am-10pm on weekends. You may contact them at the following nos. 09175666245, 9662316, or 7209150 to book an appointment. Disclosure: My personal experience with Nail Tropics (Trinoma) may be different from yours. Please be guided accordingly when you plan your visit. I was invited by the owner to try their services and I fully paid for all the services that I availed. I came in anonymously but the shop prohibits clients on taking pictures and this forced me to reveal my invitation. I didn't want to make a review without photos. i've tried their branch pa lang at eastwood, okay naman so far.